Candlestick charts are formed using the open, high, low and closing price of an instrument over a specified time frame. Candlesticks are colour coded to readily display at a glance whether the prices were a net positive or net negative on any given day. Normally, white, blue and green candlesticks indicate a rising price, whereas black or red candlesticks indicate a falling price. Candlesticks in this respect help identifying the trend of a market. Now we will look at some common candlestick patterns that you can watch for. There are many different named patterns, some still retaining the Japanese nomenclature. Many of them build on simpler patterns, or are just variations, and I don’t know anyone who remembers them all – most traders who use them probably remember about a dozen at most. It is more important that you understand how the sentiment of the market is revealed by the candlestick charts than that you remember individual patterns or names. Some charting software will automatically point out the common candlestick patterns. This is a useful tool but you must be aware that it only looks at the candlesticks and not at the general situation, which could give you further clues whether the candlestick pattern was relevant. It is not just a situation of finding a pattern and placing your bet, you have to make sure that other indicators are supporting what the candlestick pattern is suggesting. Steve Nison himself, who as mentioned previously is credited with bringing the Japanese candlestick methods to the Western world, emphasizes that you need to combine them with other techniques for confirmation. In the following charts, the white candles are bullish and the red are bearish, and the stochastic is plotted underneath to give some indication of the market sentiment. These charts will show you the general form of the patterns, but those shown may not always be “successful”. Nothing in trading works all the time, and that is not a fault of the analysis, just a fact of life. First though, let’s look at different types of candles. As a reminder, the solid bit, the real body, is drawn between the opening and closing prices for the trading period and is coloured according to whether the opening or closing price is greater. The lines on each end, the wicks, extend out to the maximum and minimum prices seen during the trading period. They can be long, short, or even non-existent if the maximum or minimum is also the open or closing price. The other point that must be made is that each candle stands on its own, signifying what happened on the day (or other time period) in question. Thus it’s quite possible to have a bearish candle on one day that closes at a higher price than the previous day – it’s just all higher prices. It is important that you understand this basic concept so that you can appreciate the variety of candlestick patterns that can be formed. The Japanese started using candlestick patterns for trading rice sometime in the seventeenth century. Japanese Candlestick patterns or charts are called so, because the price bars looks like candles. It is a pictorial representation of the open, high, low and closing period of the price. The Candlestick is made up of a body and two shadows. The body is depicted as a column, which is bounded by the opening price and the closing price. The shadows are just vertical lines, a line above the body to the high of the day – the upper shadow – and a line from the lower body to the low of the day – the lower shadow. It is customary for the body to be white if the close is higher than the opening, and filled if the close is lower. It is applied to any traded security, be it stocks, commodities, forex or bonds, as long as the security has an open quote. Take a look at two typical Japanese candlesticks depicted above. The body of the candle is called as ‘real body’. It is bound by the session’s opening and closing price of the security. The vertical lines above and below the body are called shadows, in candlestick pattern terms. They represent the high and the low prices for the session. The Candlestick pattern pictorially represents where the market opened and closed. The body of the candlestick pattern represents the area of price range between the session’s open and close where buying and selling support was forthcoming. A filled candlestick pattern represents a victory for the bears for that session. Likewise, an empty candlestick pattern represents a bullish trend for that session. The shadows of the candlestick tell of the failed attempts of bulls or bears to dominate the market their way. An upper shadow tells us that the bulls attempted to take the market higher (by the length of the shadow), but their efforts failed to attract further buyers to join in the bull thrust. It only attracted sellers sufficient to accommodate the would-be buyers. The bulls retreated to the body of the candlestick again as the rally could not gather steam. Conversely, the lower shadow of the candlestick indicates the extent of the failure of the bears to take control of the market. As bears sold, bulls were ever present to buy up anything offered at these new lower prices. On recognizing the overwhelming preponderance of buyers, the bears were forced to retreat to the cover of the body. Note: If coloured candlestick patterns are used, normally a blue or green-bodied candlestick represents a bullish candle, and a red-bodied candlestick represents a bearish candle. What is the Japanese Candlesticks trading method of technical analysis? ‘Japanese candlesticks’ is a tool used mainly for short-term trading activity. These patterns are dependent on the open, high, low, close values of the price. The high and low are described as shadows and plotted as a single line. The price range between the open and close is plotted as a rectangle on the single line. The resultant figure resembles a candle, hence the name. How did the Japanese Candlestick Charting technique originate? The Japanese Candlesticks trading techniques was developed by Japanese rice traders way back in the 1750s. Today, the Western world is slowly getting acquainted with its value as a serious tool for analysis of such diverse instruments of financial trading like stocks, commodities or Forex. How many candlesticks patterns are there? There are many types of patterns in the candlesticks trading method. Once you become acquainted with these candlesticks patterns, you will learn to distinguish between the primary and the secondary signals. One of the most easiest way to learn the signals is to review past charts and check for formations and reversals. Do the Japanese Candlesticks pattern really work? However, the candlestick patterns do provide a focused insight into the market that help you leverage the available information in a better manner. There are many patterns involved in the Japanese Candlesticks analysis. Patterns are a combination of two or more candles, which occur with regularity on charts. Understanding how to interpret Japanese candlestick patterns will give you an insight about the underlying principles to understand technical analysis methodology. That’s right, this one shows that the price didn’t go anywhere on that day. To be fair, it’s very unlikely that you will see this one, and it’s usually only on thinly traded stocks, but it’s still a doji. The reason that I started by showing you the doji is that many people consider it one of the most important candle shapes. The Japanese say “whenever you see a doji, take heed”. It often happens at a reversal point, and you can see why. The opening and closing prices are exactly the same, regardless of where the price went during the day, and this shows that the market may be in a state of indecision, not happy to finish the day up or down despite (usually) trying different values during the day. In practice, you may see near-doji where the opening and closing prices are very nearly the same, and you can usually treat these in the same way. Some of the doji shapes have special names and have certain meanings. 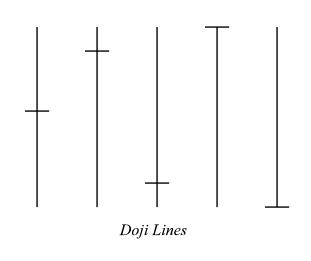 For instance, the one on the right of the Doji Lines diagram which has the real body at the bottom is called a gravestone doji, for the obvious reason that it resembles one. The Japanese talk of this as the soldiers going out during the day, but coming back to camp at night. It’s particularly significant if you see it in an up-trend, as it shows that the bullish traders tried to rally the stock and failed at the end of the day, which implied that there will be a reversal. The doji next to it, with the open and close at the top, is picturesquely called a dragonfly doji, and has just the opposite meaning. If you see this in a down-trend, then you should look for a reversal upward. This shows that the bulls managed to pull the price back up by the close despite the market trying to continue the decline. In both cases, you must look for confirmation from an oscillator that the market is in an overbought or oversold condition, as appropriate. The doji can occur mid-trend and merely indicate a day of resting from the buying or selling that preceded it. Don’t make the mistake of thinking that something must happen just because you see a doji, you also have to have an appropriate marketplace. For any indicator to be interpreted as a reversal signal, it must have something to reverse, an up-trend or down-trend. But if you see a doji when the market is going sideways, you should also watch closely. The doji shows that the market has achieved equilibrium, and you should watch for a gap on the next day. If this occurs, there is a high probability that a trend will start in the direction of the gap. The gap shows that the traders have decided which direction is the stronger and started moving that way. Doji are very often a sign that something is happening, and need careful watching. a gap following a doji is a powerful sign. Closely related to the doji, and sharing some of the meanings, is the “spinning top”. This candlestick form has a small real body, and looks like a child’s top, giving it the name. It does not matter if you don’t remember most of the names, as long as you understand how the meanings are derived.